This incredible large size Ming Dynasty (1368-1644) northern Chinese coffer is elaborately carved with many of the rare motifs that were used during the Ming Dynasty, such as stylized female court figure, mermaid, unicorn, mythical animal, and several distinct floral patterns, offering great evidence in dating earlier Chinese art and wooden work. 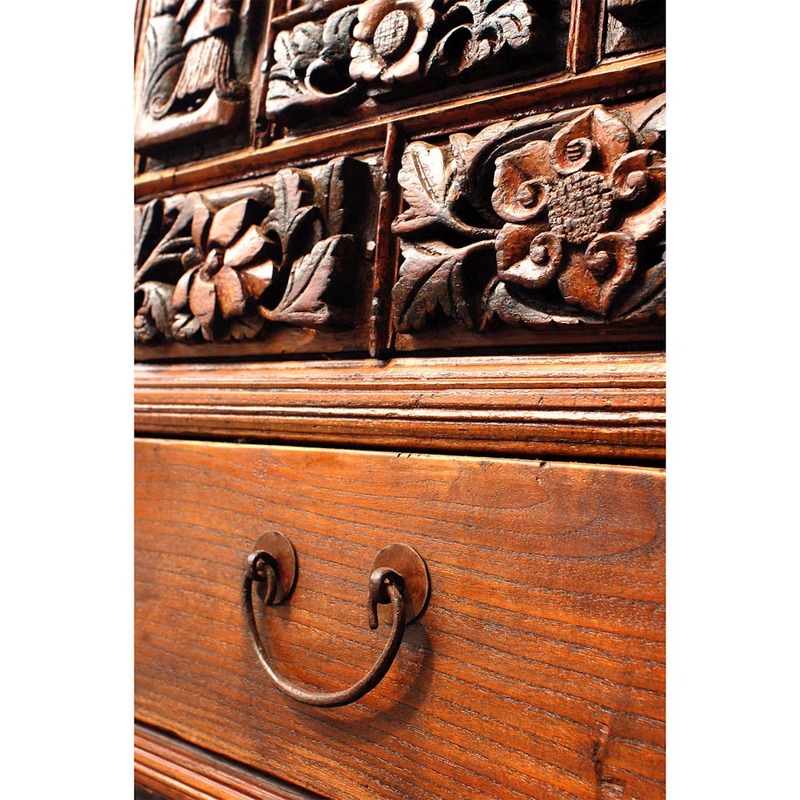 This is a very special piece as few other furniture pieces could be found like this one with all of these rare Ming motifs contained in one piece. 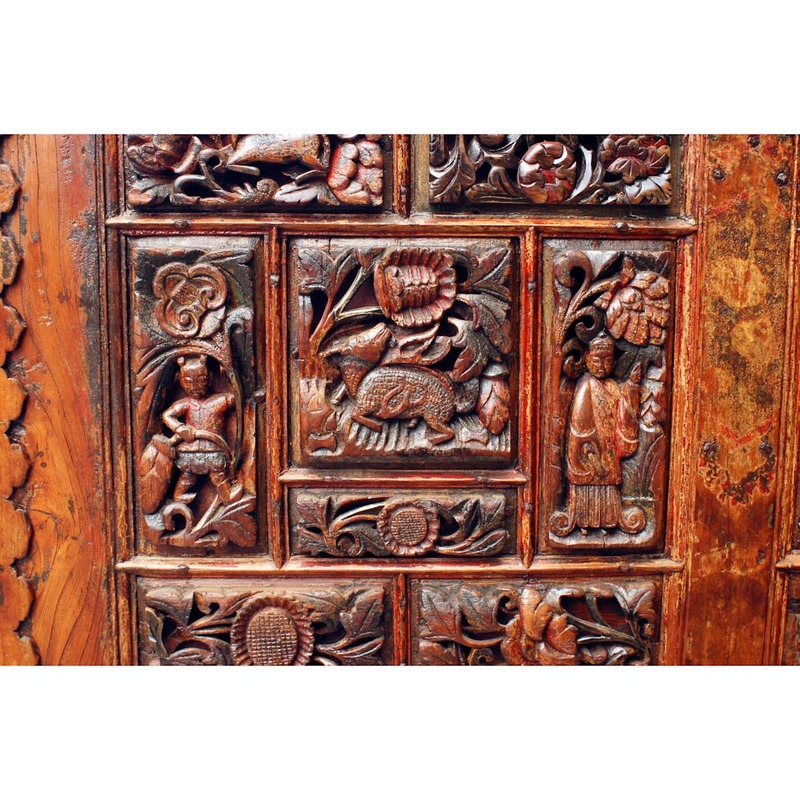 While the figure, mermaid, and unicorn on this piece are rarely seen on other Chinese furniture pieces, similar floral motifs with a “front-facing” full bloom design like those on this coffer can still be seen occasionally on the 16th to17th century Chinese architectural woodwork such as carved doors and windows, roof-tile clay art, and even carved stone work. One can compare the floral motifs on this piece to the floral pattern on ARW-011 at Shen's website, a set of four Ming Dynasty carved window screens, to a Ming Dynasty ceramic roof-tile with floral pattern shown below, or to the floral pattern on a massive size carved architectural stone base, all from similar period. 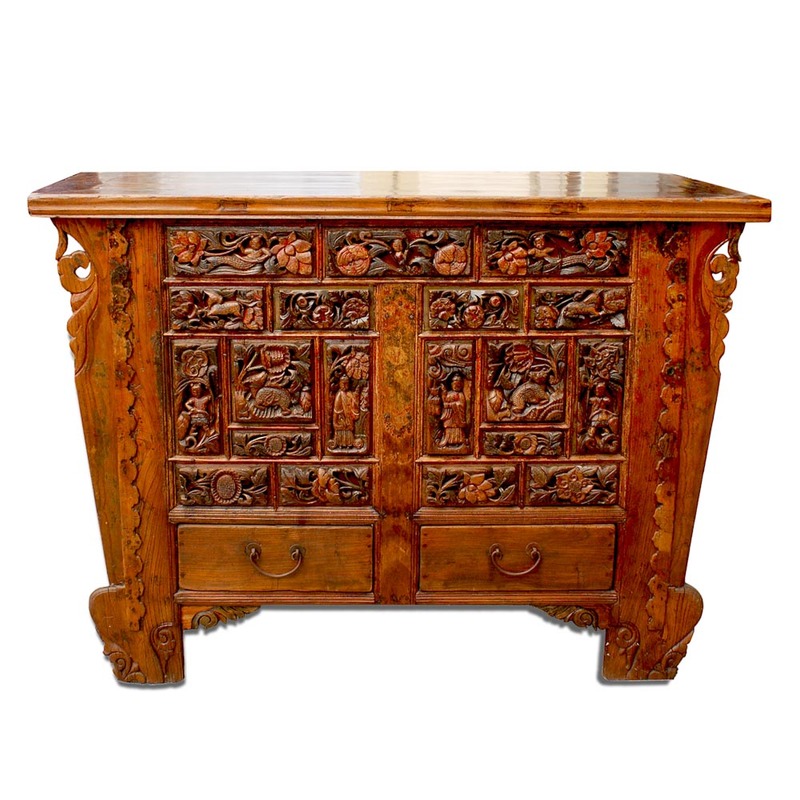 While much of the research dedicated to Chinese furniture pieces in the recent years has been focused in Chinese hardwood furniture and furniture from the south of Yangtze river, the northern Chinese furniture pieces link directly to the ancient traditional classical Chinese art due to the specialty in the lacquer and colors used and the abundant similar geographical resources from many of the national capitals being built in the north. Hence, the rich cultural back ground dating back to to many dynasties have provided much of the research material when studying Chinese art and history. For example, one can see the rare motifs on this coffer, including the style of the female figure, and the colors being used on all the motifs here, are very similar to other female figures and colors used in Chinese paintings from the same period of time. 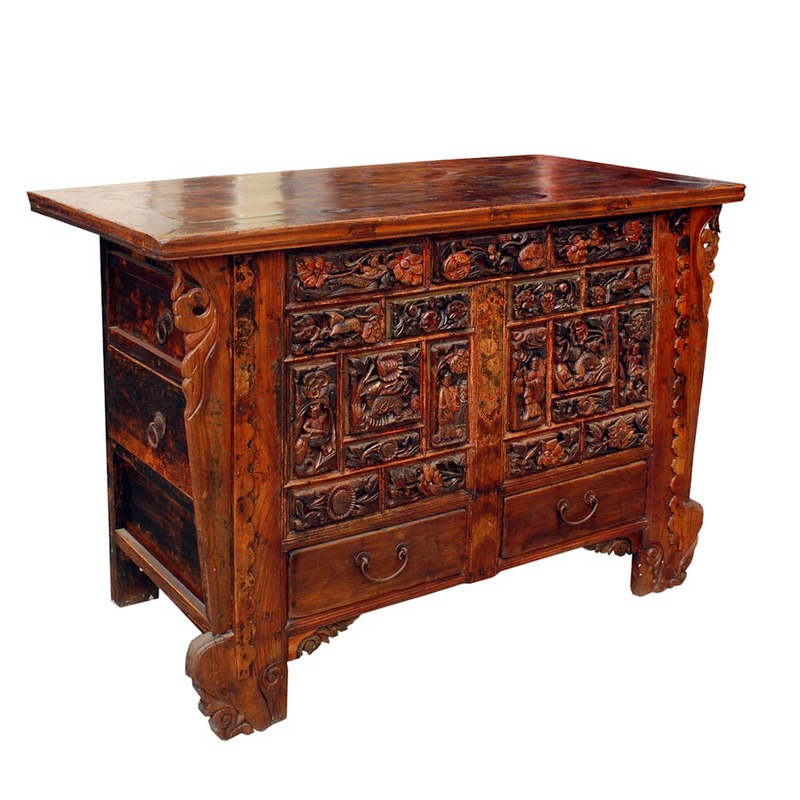 This coffer is an important and valuable furniture piece, not only because it represents the connection in between the early Chinese furniture and Chinese architectural art, but it also serves as the connection to many other forms of Chinese art. 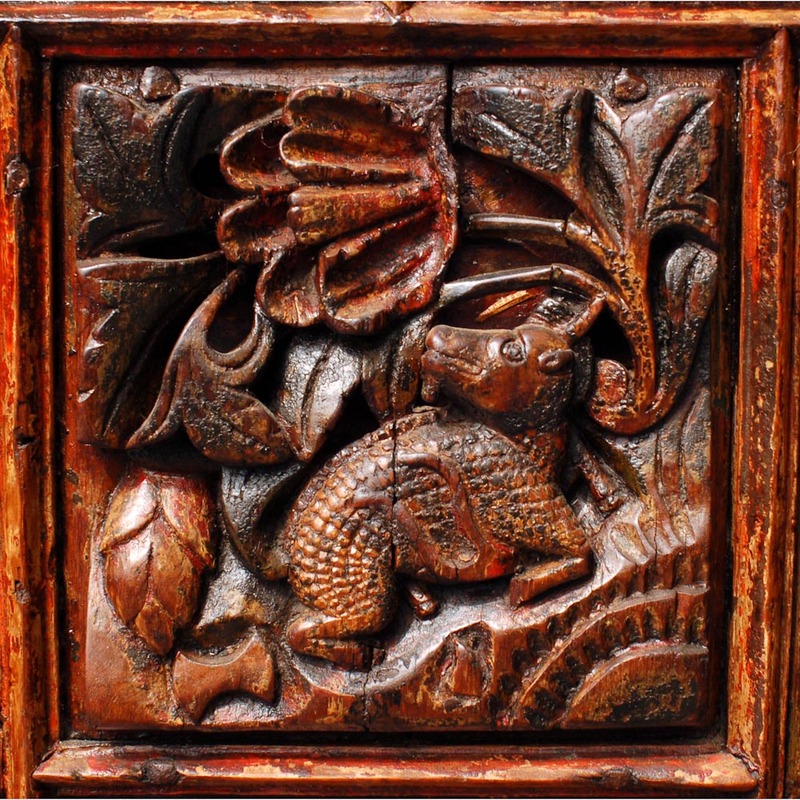 Unlike other material, wood furniture pieces rot easily and were difficult to move due to the size during the political turmoils. Therefore, few older furniture pieces from the early age have survived.